We currently drive a 2004 Jeep Wrangler Unlimited (the original, 2-door model) — and we LOVE it. A few weeks ago, the time had come to trade-in our second vehicle: a 2003 Mercury Sable. We knew we wanted an SUV. 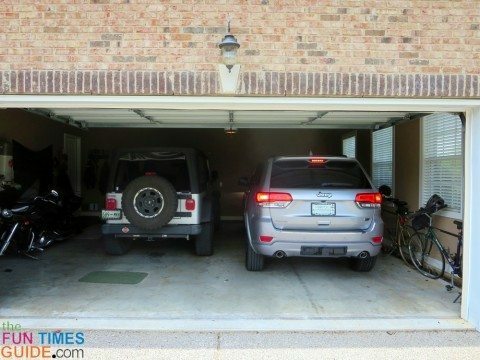 We ended up buying a 2014 Jeep Grand Cherokee Overland, and just like our Wrangler Unlimited — we LOVE it. But that’s not too surprising. We clearly like Jeeps… a lot. We actually had a great experience buying this brand new Jeep from a car dealer. And we learned a few things about buying & selling cars in the modern era. Initially, we were torn between a Ford and a Jeep. But ultimately, we decided on the Jeep. 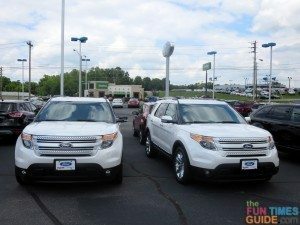 By the time we made on our second trip to look at new vehicles on car lots, we had done all of our research online and narrowed our choices down to a 4×2 Ford Explorer vs Jeep Grand Cherokee from the 2014 model year. We didn’t necessarily want a 4×4, since we already have a 2004 Jeep Wrangler Unlimited that meets all of our offroad needs. On the Ford and Jeep dealer lots, they didn’t have any vehicles that met those exact criteria, so we decided to go home and “build a car online” instead (through each dealer’s site). The salesmen actually recommended this. They did, however, point out that it would take 8 weeks to get a new car that way. At this point, we were 90% certain that a Ford Explorer Limited was the SUV we wanted, so we started on the Ford.com website and chose all of the features and options that we wanted in a Ford Explorer. The last thing you do on the Ford site is “check vehicle inventory” within a 100 or so mile radius to see if any local car dealers have vehicles with the features & options that you’re seeking. None did. We almost ‘settled’ on a white exterior and tan interior Ford Explorer Limited, but I’m SO glad we didn’t. White is not a good color for us, the wheels looked kind of cheap, and a light-colored interior would not have worked for the longterm. When you’re paying this much money for something you’ll use daily, you don’t want to regret your choice. Next, we went to the Jeep.com website and chose all of the features and options that we wanted in a Jeep Grand Cherokee. 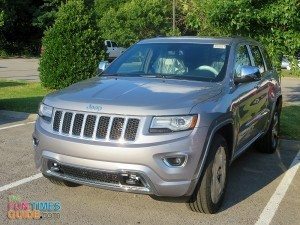 Again, we checked vehicle inventory within a 100 or so mile radius, and lo and behold there was one Jeep Grand Cherokee Overland model that was on the lot at a dealer lot right near us: Chrysler Dodge Jeep Ram of Franklin! We jumped in the car and went to look at it. We immediately fell in love with it. Believe it or not, this particular vehicle had not even been checked into the dealership yet. It had 12 miles on it and the plastic wrap was still covering the tires and the interior. We were the first ones to set eyes on this baby — and I’m so glad that we did! 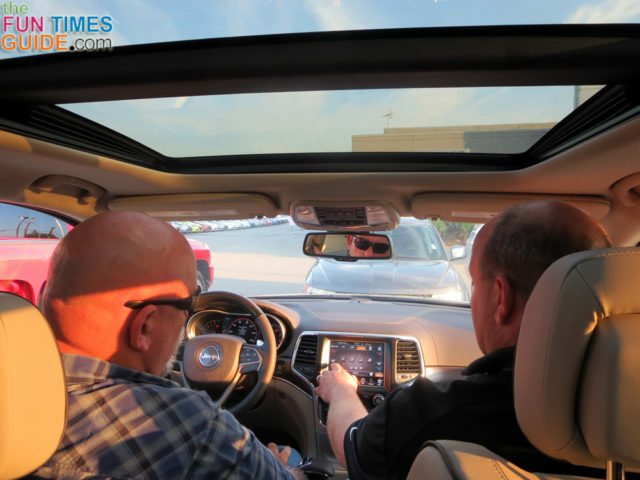 Since the vehicle hadn’t even been prepped yet, we ended up test-driving another Jeep Grand Cherokee Overland from the same year — just to make sure we liked the ride. We did. We liked the ride and every little thing about this vehicle. Top it off with one that’s in our color of choice (silver exterior with black interior), and we were SOLD! We started the paperwork right away and since it was closing time, we returned in the morning after they had properly prepped the vehicle to take ownership of it. We are so happy with our 2014 Jeep Grand Cherokee Overland model! I can’t begin to tell you all of the little ‘extras’ that are inside this vehicle. Add that to all of the little ‘extras’ that we worked into the deal, and we are super happy with our new car buying experience. Who ever says that? I mean really. But I’m serious. We were extremely happy with our car shopping experience this time. I hope this encourages others to think positive and not dread talking to car salesmen as much as I was dreading it at first. So that’s how it was buying a Jeep Grand Cherokee recently. 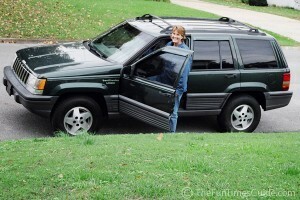 And here’s a little about the day we brought our used 1994 Jeep Grand Cherokee home. I’ll be honest, I wasn’t sure that I’d ever want a Jeep Grand Cherokee again after buying a used one and only driving it for a short time before we sold it. Our older Jeep Grand Cherokee must’ve been driven hard by its previous owners. And there were very few features that ever attracted me to that vehicle. It never gave us any trouble, but it basically felt like a shell of a vehicle — no frills at all for an SUV. There just wasn’t much to make me want to take the Grand Cherokee whenever I had a choice of vehicles to drive. Not so with our new Jeep Grand Cherokee! There are so many creature comforts inside this Overland model that both hubby and I look forward to driving it — on long and short trips. I seriously can’t think of anything else. Suffice it to say, we don’t miss those features a bit, and we’re 110% happy with our Jeep Grand Cherokee Overland. It’s even a great dogmobile! 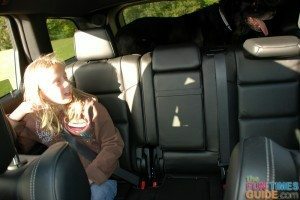 Even though I’ve taken our 100-lb dog on a few rides (with the backseats down and without), the Jeep Wrangler Unlimited will probably always be our go-to vehicle whenever the dog’s going with us. Why? Because it’s just such a rugged and open-air vehicle — perfect for toting dogs. Whereas the Grand Cherokee Overland is a much nicer vehicle, inside and out. We’d like to keep it that way (… and fur free). What do you drive? Are you thinking of getting a Jeep?